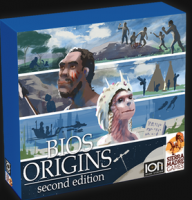 Represent an intelligent species developing technologies, economics, politics, and consciousness in Bios:Origins Second Edition. This is the 3rd and final game of the Bios trilogy. We have reworked the game Origins from ground up, keeping its bottom-up take on civilization games, but with new features to integrate it with the arc from the predecessor games Bios:Genesis and Bios:Megafauna (second edition). The old Origins had dice, these are gone, but the classic map is retained. Bios: Origins, chronicles the sudden appearance of consciousness. Not intelligence, which was a problem-solving faculty that gradually increased throughout the Bios: Megafauna era. Consciousness was like nothing seen before, and perhaps the aforementioned cave paintings were the first sign of this faculty. New is a hexgrid, found on the back of the map board, for building custom maps. This can be used to recreate the cratons from an end state of Bios:Megafauna (second edition) if you are playing a trilogy campaign game. Game should be released in 2019 Q3 (07-29-19), so watch the news!